Discover unique raw food tips, recipes, techniques, raw wellness stories, super-efficient time-saving fitness tips and much more. Sign up for our FREE RawSkilz Newsletter here. My Ten Year Raw Experiment! I am not a bodybuilder. I never was nor did I ever want to be. But I love crushing myths-the bigger the better. I wanted to know (not just extrapolate or philosophize but really know) if I could build muscle on a totally raw plant-based diet of whole fresh produce and zero supplements, pills, powders or gimmicks. Or so-called" super foods" other than what nature put here for us in whole form. I was an extra- gangly, pale, an-athletic nerd from NYC who never liked gym class or "healthy food". For the last ten years I have exercised less than one hour per week and have eaten a 100% raw, plant-based diet of fresh, whole, raw fruits, greens, vegetables, nuts and seeds. I do not have much time to exercise or eat well, but I did it. Click the "send to friend" box below to share this information. It's especially helpful to those who are having doubts. See how Chris builds real raw muscle here. 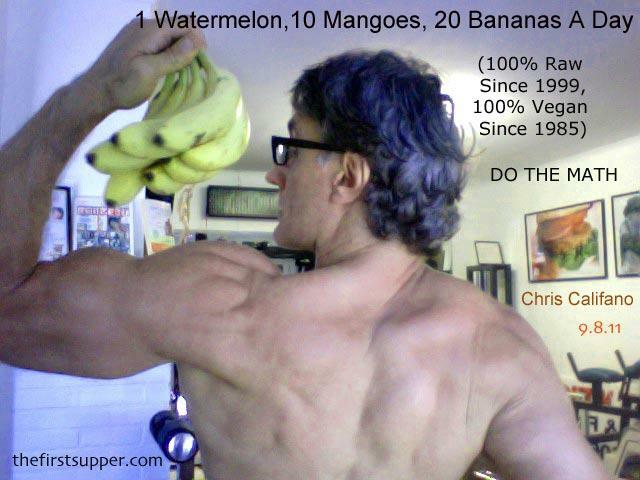 "I used to think that I was "building muscle" when I was a cooked vegan almost three decades ago. But that was just "force-fed" size, not pure muscle. I can only imagine how much toxic waste is stored up in the tissues when a person eats a diet of animal products as well. Of COURSE they can get "bigger" but pound for pound, the best health, muscle and performance, in my experience and training athletes for decades is that a pure raw vegan diet without any supplements (they just toxify your tissues and retard the creation of pure muscle mass) is by far the best way towards your best body. ...to get equal wellness results in terms of lowering cholesterol, eliminating "cold and flu" symptoms, increasing energy and almost totally eliminating chronic disease risk with supplements or treatments. Subjects will be evaluated medically, physiologically as well as by a panel "jury" of their peers. If any natural doctor or nutritionist in the Long Island area would like to challenge my raw team in the Wellness Event Of the Millennium, please contact me at chrisc@thefirstsupper.com. Your pills, powders, herbs and treatments against our raw food program and counseling. Two groups of men and women of varied age groups will be carefully chosen much as lawyers select a jury. The appropriate news channels will be notified and the challenge will be documented. Excess fat loss, overall health, strength, endurance, body composition, resistance to illness, energy levels, ability to sleep, sleep requirements, body odor, athletic ability, cholesterol levels, breathing capacity and more will be tested before and after by a qualified third?party physician. Before and after photos will be taken. Nothing will be left to chance. Sponsors will be selected to finance the challenge and reward the winners. All money will be donated to a mutually agreed?upon charity. (If there are any left that are truly legitimate! Probably not in the health field!) So... are there any takers? Or are all businesses that call themselves "health professionals" too timid to actually solve the health crisis here in New York? There is no health crisis. There is a disease crisis. There is no such thing as health care - it is really disease care. When president Obama announced in his acceptance speech that Americans should work on preventive health care, not a single person applauded audibly. But when he said the words "reduced cost health care" the noise was deafening. It is time for us to put our money where our mouths are and actually step up to bat. Here is your chance. Are you in?